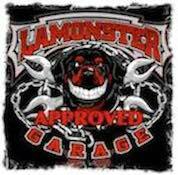 For out of country orders contact us at lamonstergaragesales@gmail.com for shipping quotes. Same Great Product now in Non Aerosol!!! A Spray and Wipe detailer, that creates a durable diamond like shine. It is a silicone free, spray and wipe detailer, that works by hyper-wetting bugs, dirt and road film. NOTHING EASIER FOR BUG REMOVAL & WITH CONTINUTED USE BUGS WILL NOT STICK. Spray on every surface with no white over spray or greasy film. Black Dymond is non- streaking and leaves no oily residue. Black Dymond Detailer is extremely durable and provides protection from dirt accumulation, acid rain and ultraviolet rays. Bugs and road film are easily removed from paint (clear coat), windscreens, face shields, plastics, goggles, vinyl and chrome. Black Dymond Detailer contains no petroleum distillates, ammonia or alcohol and is manufacturer approved for use on Factory Coated Windscreens, face shields, Lexan, Plexiglas, Acrylics & plastic. Black Dymond will provide a water repellant shine. The water will “bead and blow” from windshields, face shields, riding goggles or glasses. It is safe on custom paint, murals, pinstriping, and vinyl graphics. For best results spray as if you were painting with a paint can. Spot spray only on tough areas. Simply spray and wipe one area at a time to remove road dirt, film and bugs from all surfaces. Great for use as a “touch up” between washing and polishing. For best results, wipe with a quality clean microfiber or 100% cotton towel. Black Diamond Detailer is streak free as long as you keep the wipe towel fresh. If streaking occurs, you should replace the soiled towel. This product is Awsome! I’m on my second six-pack. I use nothing else to freshen up my RT Limited! I have used a bunch of different products until we attended the 2016 spyderfest. I thought I'd give it a try, if not good I'd keep looking. Well I've ordered the diamond cleaner and black trim renewer now and it will be my staple cleaner/polish until Lamonster has something better. This is an excellent product that leaves an incredible shine. Absolutely love it. best of the products I have used. Best bug remover I have found. I was sent this with another order. was so impressed with it that it's all I'll use to clean my bike. Good Stuff!! !